Philip Johnson, one of the architects behind the Puerta de Europa towers, is said to have proclaimed, "We must end the right angle if we do not want to die of boredom. The skyscraper is over; we can forget it." He was true to his word in his design of these, the first towers in the world designed at an incline of 15 degrees. 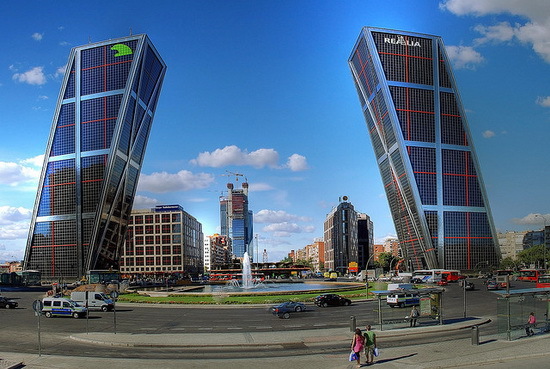 Inaugurated in 1996, the Puerta de Europa is a pair of 26-story office buildings located at Madrid's northern edge. Johnson and fellow architect John Burgee were hired by the Kuwait Investment Office in 1989 to build the towers. For this reason, they were first known as the Torres KIO, although after an embezzlement scandal the buildings changed hands and are now better known by the name that means "Gates of Europe" - a moniker that reflects their status as symbolic and geographical gate to the city. Their distinctive look has made them something of an icon in Madrid and an object of awe in the architecture world: such a design requires careful engineering, including a specially-strengthened central axis of concrete and steel and a number of elevator shafts that serve certain floors within the building. The Plaza Castilla is overwhelmed by Puerta Europa I and II (which can be differentiated by their blue or red-colored helipads and differing logos), but one of the buildings' former owners, Caja Madrid (Bank of Madrid) added a third important element in 2009. The towering "Obelisco de la Caja" (Bank Obelisk) is a 7.7 meter metallic cylinder - not technically an obelisk at all - that was installed to celebrate the bank's 300th anniversary. Inspired by the modern artist Constantin Brancusi's "Column of Infinity", the Obelisk balances the visual momentum of both leaning towers with its strong vertical stance. For a taste of something more classical, head to the other side of the plaza. There, past a graceful fountain, stands a dramatic granite monument to turn-of-the-19th-century duke Jose Calvo Sotelo, whose murder helped set off the Spanish Civil War. Its cool stone figures contrast nicely with all that metal and glass. You can find the Puerta de Europa close to Chamartin train station and Plaza Castilla. (Plaza Castilla is also the closest metro station.) The plaza represents the intersection of three major roads: the Paseo de la Castellana, Avenida de Asturias, and Calle de Matteo Inurria. Given its location near Madrid's northern entrance and major bus/train hubs, it makes a good quick stop on your way into our out of the city, a fitting introduction or conclusion to Madrid's unique mix of sleek, modern innovation and careful remembrance of history.